Jewish Home chairman criticizes Sheldon Adelson's Israel Hayom newspaper, refers to it as "Pravda". Economy Minister and Jewish Home chairman Naftali Bennett on Sunday criticized the Israel Hayom newspaper and referred to it as “Pravda" – a reference to the press organ of the communist party in the Soviet Union, which was famous for its lies in the service of a dictatorial government. "It saddens me," said Bennett of the sale of Makor Rishon, which has taken a national religious line. 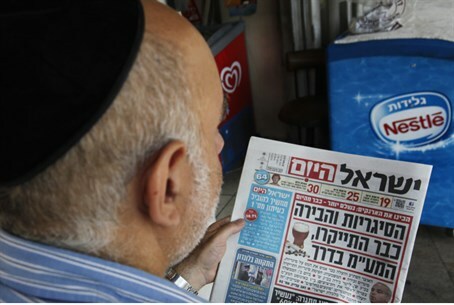 Israel Hayom has been targeted by a new Knesset bill which would attempt to force the paper, which is currently distributed free of charge, to charge money, thus making it less popular and influential. The Jewish Home party co-signed the bill that limits the nationalist paper, reportedly to put pressure on Netanyahu. Bennett’s comments echo similar one made by Foreign Minister Avigdor Liberman several months ago. Liberman was incensed at the time by a report in Israel Hayom regarding the race for the mayor of Jerusalem, and he accused the newspaper of serving the interests of mayor Nir Barkat. "If it looks like a spin, sounds like a spin and smells like a spin – it is a spin," Liberman said. "If you take into account that it was published in the Pravda Israel Hayom newspaper, then it is obviously spin from the Barkat staff." MK Robert Ilatov of Liberman’s Yisrael Beytenu party is one of the MKs signed to the new bill that would limit Israel Hayom.